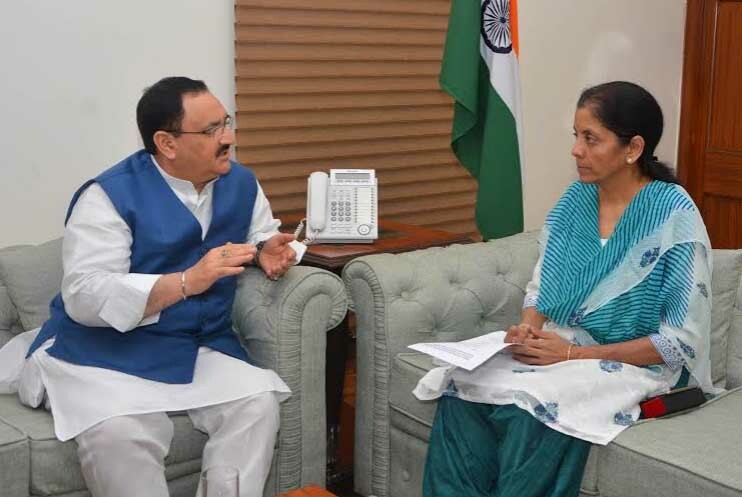 New Delhi : The Union health and family welfare minister J P Nadda met Union Minister of State for Commerce Nirmala Sitaraman in New Delhi and requested her to include apple in 'Special Products' category and increase tariff on imported apple within the framework of World Trade Organisation rules from other countries to save the domestic apple growers of himachal Pradesh who are facing onslaught of Chinese apples due to low import duties which has ruined the economy of the himachal apple growers and has adversely affected the economy of hill state. Union health and family welfare minister J P told union Minister of State for Commerce Nirmala Sitaraman that, state agriculturists and fruit growers have been adversely affected due to dumping of Chinese garlic through Nepal and Bangladesh in India at zero duty as well as illegal smuggling of Chinese garlic which has affected local producers of garlic in Himachal Pradesh. He said that apple contribute to state economy comes around Rs 2500 crore annually, which contributes around 6% of the state GDP, He told that almost half of rural population across six hill districts of the state depends heavily on Both apple and garlic crops for their economic sustainability, livelihood and prosperity in the region. Union health and family welfare minister J P Nadda urged Sitaraman to take effective steps with Ministry of Home Affairs, "to check illegal garlic smuggling in the country from adjoining countries mainly from Bangladesh and Nepal which has emerged as main centres for illegal smuggling of garlic to India.